It was two firsts for this homebrewer. 1. Adding spices to a beer (excluding coriander in the wit-bier). 2. Adding fruit/vegetables to a beer (excluding the orange peal in the wit-bier, or grape juice, or honey). Yep, two firsts in this Pumpkin Porter recipe. As for adding the pumpkin, straight from the can baby! No cooking it here. Oh, you are supposed to cook it or roast it? Or does it really matter? It gets boiled. 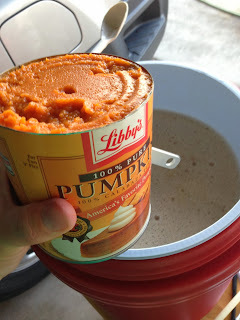 Simple on the pumpkin...open can, and add to mash. As for the spices, I could have gotten the basic Pumpkin Pie spice, but we chose to create our own. Experimentation commences. For a 4.25 gallon final volume, here are the ingredients.